When In-Sync was first called by a family in Poetry TX to help relocate 20 exotic cats in need of a new home we had no idea just how urgent the situation was. We made plans to meet the family on the property on Wednesday June 29th. When we walked around we saw 6 lions and 2 cougars in adequately sized enclosures outside. Although there were some big concerns we didn’t see anything that we would have a lot of problems with. As we continued our tour, we were taken to a horse barn that was completely closed up. Our guide told us he needed to make sure no cats had escaped before he would open the door for us to go in. When the door opened we were hit with an unmistakable smell of rotten meat. On the left was a freezer of old rotten meat that had been covered in maggots then refroze. Just past the freezer was the first “stall” on the left. There were two cougars inside with piles of feces, old rotten food covered with bugs and maggots and absolutely no water. What we saw next was the most horrifying of all. Kane was laying in a corner weaving and shaking back and forth and was obviously very sick. As I ran out to call our vet we started looking for a hose to get water to the cats. Kane tried three times to get up to get to the water with no success. Finally as he fell each time he was able to get a little closer to the water and he began to drink. 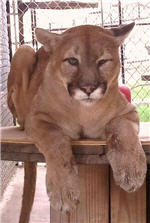 When our vet arrived we had to dart Kane’s cagemate so that we could get to Kane and load him into a transport cage. Once at our vet and test were completed, we were able to bring Kane home. After 2 weeks of treatment Kane was strong enough to go outside for the first time in 10 years. The first thing Kane did when he was let out on grass was to lay down roll around and start eating the new green stuff he’d never seen before. He was so happy! And we all were so happy for him. As Kane walked around we noticed he had a large lump on one of his shoulders. A week later Kane seemed to have had some kind of stroke or seizure and again we took him back to our vet. We x-rayed his shoulder and found that his leg had been broken for quite some time and was left untreated. There was nothing we could do for it now. 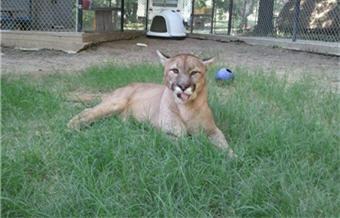 When Kane was again well enough to go back outside he seemed, again, the happy loving cougar we knew he would be. As yet another week went by Kane had another symptom of a breathing attack. We rushed him back to our vet again. This time we found out that Kane had cancer. It started out to be a bone cancer that had spread to his lungs. When we realized there was nothing more we could do for Kane, and it seemed that he was ready to go, we had to make the unpleasant decision to let Kane go to heaven. You can read more about Kane and see some of his video’s on our website and blog titled, Poetry in Motion. All of us at In-Sync feel so blessed even more for the opportunity to meet Kane and share in the last month of his life. We got to see him chase horses, jump on top of a spool, and to feel grass under his feet for the very first time. We are all better for knowing him. If you need to Email Us, please go here.